Many gas plants have one or more columns to provide product fractionation and purification. The 3 most common are the deethanizer, debutanizer and stabilizer as shown here (condensers and reboilers omitted for clarity). Creating a gas plant simulation model requires assigning specifications to the columns, such that they converge and also accurately model the operation of the plant. Good modeling specifications result in a robust model that can be used for design and troubleshooting applications. The deethanizer is designed to take liquid from the low temperature separator (LTS) and remove ethane and lighter components from the liquid. 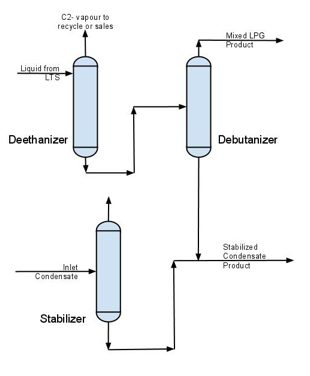 The bottoms from the deethanizer are sent to the debutanizer where they are separated into a mixed LPG product (mostly C3s and C4s) and a stabilized condensate product (C5+ material). The stabilizer takes inlet condensate and removes C4- material in order to meet a vapour pressure specification. Product properties that are of interest are the C2/C3 mole ratio in the LPG product and the Reid Vapour Pressure (RVP) in the stabilized condensate. For simulation purposes, the above specifications are most useful when troubleshooting an existing fractionation train. By using these specifications in a simulation, the predicted product properties can be compared against measured samples and the simulation parameters adjusted to match current behaviour. C2 mole fraction in bottoms or C2/C3 mole ratio in bottoms, a C2/C3 mole ratio of 2% is common. RVP in bottoms - 12 psia would be a typical maximum value. Reflux Ratio - 0.5 or 1.0 is a common value. When creating a new simulation for a fractionation train, it is usually easier (and good modeling practice) to start with flow rate specifications for the columns. Once each column is converged, switch the column specifications from flowrates over to matching product specifications as listed above. Gas plant fractionation column simulations are generally robust and will operate well over a fairly wide range of inlet conditions.